Taza, was the son of Cochise. He was a Chiricauhua apache, and at the death of Cochise was acclaimed the leader of the Chiricauhua. He was more notable as a Peace Chief. There is only one famous story of Taza as a war leader. It seems that on one of the "jumps" off reservation Taza envisioned a raid on the Mexicans. During the Apache wars of Arizona raids on the Mexicans, whether actually in Mexico or in parts of Arizona and New Mexico that were American in name only were pretty much considered neutral game. The Army and the Arizona Rangers (who were only 26 in number) would not bother themselves to protect Mexican-Americans much. The raid that Taza planned and led was a disaster. Over 20 of the small population of Chiricuahuas remaining were killed. It was a devastating loss of equipment, horses, and mostly in warriors. Taza returned to the camp, those who had survived were carrying the dead as was the custom of the Chiricauhua. The Chiricauhua do not practice sky burial like the mountain folks, they use graves. Taza dismounted without a word and went to his lodge to get a shovel. He made it known through gestures that he did not want any help. He would not speak. He only worked at digging a grave. When he was finished, he gathered the body of one of the warriors he had led to defeat into his arms and buried him. He did this until all the warriors were buried. Taza then gathered up all of his possessions. He began to distribute them to the families of the dead warriors. This eventually included all his weapons, and the clothes he wore. He still refused to speak a word. Naked he went to a hilltop outside the camp. He sat down and faced the sunset. He sat there in silence all through the night. When the sun came up the next morning Taza changed his position to face it. People came to offer food and water, Taza refused with a shake of his head and a curt gesture of dismissal. On the second morning an Haattaallii came to join him along with Taza's brother Naitche. The brothers sat there while the Haattaallii sang prayers. After three days had passed Taza accepted some food and a little water. He still would not speak. From that day, the only food Taza would accept was the food that was offered by the families of the dead warriors. He never again in his life claimed to possess a single thing. The people elected Taza to retain his position as their chief, but Taza, while accepting the duties, always refused to speak in council. He would only act as a servant to the wishes of the nation. He would go on other raids and be in other battles, but he never would accept leadership of any kind. When a reasonable offer was made by the U.S. for the Chiricauhua to go to the San Carlos Reservation, Taza led his people there. When Geronimo, Juh, Mangas, Nana, and the other left after the massacre of The Dreamer at Cibecue, Taza stayed behind. When the Paiute Shaman Wovohka came to try and teach his Ghost Dance to the Apache Taza told him "We will all be ghosts soon enough, no need to hurry things by dancing." 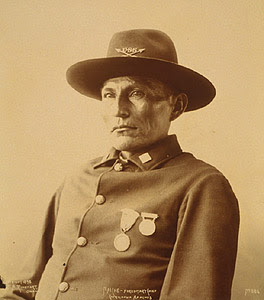 Taza's last office was as "Honorary Chief of Scouts" at Fort Apache. The uniform he is wearing shows a hat device of U.S.A. over crossed arrows. It was the Apache Scouts who trained Theodore Roosevelt's unit of Rough Riders. Taza was my great-great-great-great-great-Grandfather. His daughter married into the White Mountain people. He was a great man. His lesson of truly accepting responsibility for actions made as a leader shows the venality and cowardice of the folks who claim those titles today. Taza not only would attend the burials, Taza would dig the graves of those who died under his leadership. I would go in the company of Taza to the gates of Hell itself.